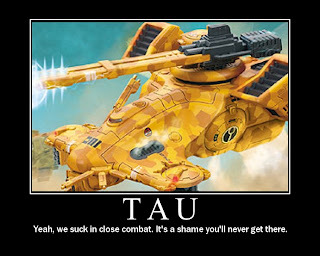 So the other army I'm thinking about taking on our big Sat game day is Tau. My Tau got seriously wrecked at the 1500 tournament, but as it had been nearly a year since playing them I felt a bit rusty and looking back I can find plenty of tactical errors on my part. Not to mention I'd redo that list as well to take even less troops and more guns/speed bumps. I'm thinking with the extra points I can field a pretty nice army that should be able to put a good clip firepower with bubble wrap to keep those assaults off of me. It isn't a lot on the table but it is a lot of guns, but also a ton of KP (16). The Piranha and Kroot should be enough buffer to slow down the enemy from assault, and I should be laying down lots of high Str low AP shots. I've never been this light on troops at 1850 and considering how easy it is to vaporize Kroot and wipe out FWs it might not work out well for me. In the end I think this army is going to be all about killing the other army as dead as possible. There's a good clip not painted (2 Piranha, 14 Kroot Hounds) but everything is assembled and ready to go unlike my 1ksons. Given there will be 1-3 other chaos players it might be nice for the group to get something else in the mix. The question is will I actually have fun playing them (the tourny was a little brutal) or would I have more fun with something else. Every time you break Tau out, you end up not having much fun, so will this even really differ?